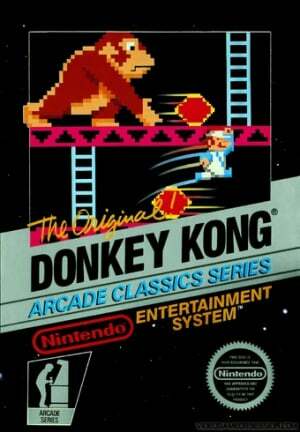 The classic that launched the careers of Donkey Kong and Mario. Climb all the way to the top and save the beautiful Pauline from the paws of the giant ape in this colourful platform game. 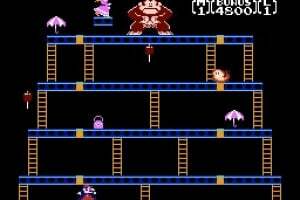 Released in arcades in 1981, Donkey Kong became a cultural phenomenon everywhere and put Nintendo on the map among video game enthusiasts. It introduced a little hero called Jumpman which would later be better known as Mario. The Game & Watch version introduced the +Control Pad which became a standard in the industry. The NES version, which you can play here, was a launch title for the console as well as one of the most faithful adaptations of the original arcade game. heh, well let me be the first commenter to say that i did buy this game, anlong with Mario Bros. I consider it more of a collection than anything else, i just dont understand why they needed to trim this down back in the day when the NES could easily handle the 4 levels and begging intro animation, just look at mario 3 or kirby. This was from the early days of the NES where these kind of games were common. It took Nintendo a while to get to the likes of Mario 3 and Kirby. One of my friends had an old NES and I'm fairly certain he had a cart which had both DK and DK Jr. on it. Wouldn't that have been a much better release for the VC than trying to sell two very small games separately? Actually, I have to disagree on this one. I bought this mid december, and I still get it out for a blast. Granted, there are only three levels, and the arcade version would be so much better, but it keeps you coming back for more, and is certainly a break from the norm. This is vintage nintendo charm at it's best. The later 'levels' (You repeat the same 3) can get as tense as can be expected, but somehow, the whole pure ambience of it means you don't really are about beating your high score or dying. A shame really, as it means that players won't really take the game seriously. lso a point of critisism is the whole slowness of it- see it running in NTSC and you'll rue NOE forever. In all, this is a great collectors package. Solidly entertaining, zero thought stuff that is a jewel among NES games. Just be aware of how basic it really is. Worth four quid, yes, worth 500 Wii points, that you could spend on better titles....that's your own choice. This was the first title I downloaded from the VC service. Great for a nostalgia blast but also has enough playability to keep you coming back for more. As already mentioned, only three levels but the emphasis is on trying to beat your personal best high scores as those levels repeat. A classic Nintendo game in many respects but by today's standards feels 'unfinished'. It's as if the orginal programmers thought, "Oh heck, I can't be bothered; three's enough - let's release it as is." Non-retro fans will probably be disappointed. I brought this along with mario bros purelly because I cannot ever remember playing it. Its got my addicted in a strange way because sometimes when I boot up my wii I see it there and have a sudden urge to play it. I think its a good game and im glad I finally know where the mallet comes from on smash bros now hehe. 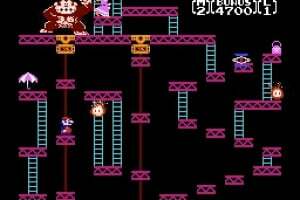 Nintendo's first platform game (Atari's Miner 2049-er was the first ever) and Mario's debut harks back originally to a 1981 coin-op. This NES conversion is totally arcade perfect, which isn't really hard considering how simple the aesthetics and gameplay are. There's no denying that it's a classic game and played a huge part in the evolution of platform games, but is it worth download? I'm not sure. There are only a handful of levels and once you've completed a level you'll get past it without any trouble on subsequent plays. I don't think it's worth 500 credits. Anyone out there with Animal Crossing on the GC desperate to play this game should try and get hold of this game off Tom Nook or one of the other villagers as it's supposed to be one of the NES games you can get hold of! There was an unlockable version in donkey kong 64 that had the four levels I think. Speaking of DK64 I hope they bring that to the VC once they bring out the trio of snes games. I doubt we'll see DK64 until the end of the year. I'm just waiting for DKC 3 to come out at the moment. It's good they put this in it too, this game is over-priced at 500 points. Until Nintendo adds an arcade section to their Virtual Console service, then I have no interest in downloading Donkey Kong. Or Mario Bros. Or DK Jr, DK3, Punch Out, Killer Instinct, Popeye, or any other arcade classic that got butchured in its home conversion. Speaking of DK3 (not DKC3), when are they going to release that? ...nintendo owes us those other lvls. was so sad to not get to play a childhood favorite. I had to buy this, it was the first video game I ever played (the arcade version). It certainly isn't the best home port of this (I say that is Ocean's Version on the Commodore 64), but it's a fine game and it is a Famicom launch title. It has a certain pedigree and it should be respected for that. I also got Donkey Kong Jr. and Mario Bros. Because as someone else said, they are kind of a set. I'd download this, but the arcade version is on DK 64. 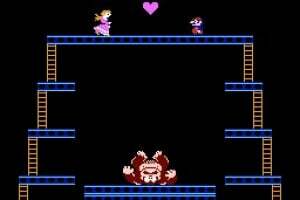 Anyways DK & DK Jr. are nice little gems. Fans of Pac Man, and other ancient gaming goodies will enjoy 'em. When is Nintendo going to rerelease the actual arcade versions on VC? Wow, why the low score? Yes, the game may not be as long or involving as later games, but at he time of it's release, it was one of the finest platformers peoplehad see, and in terms of score-based platfrmers, it's still one of the best. I really don't understand how people claim to like retro gaming, yet still refuse to play games older than, say, SMB1 - Donkey Kong sill holds up today, and with the Wii's ability to freeze state, making your hi score stay in the game after you end your session, it's incredibly fun to try pushing that score higher and higher. Yes, the NES version may be missing one of the stages from the arcade version, but that stage honestly wasn't that fun in the first place - do you really miss it? Even without that stge, Donkey Kong for the NES still deserve a full 5 stars. I remember playing this on Animal Crossing after I found it in that game. It was a good way to kill a few minutes, but if you've got, like, and hour to play any NES game you like go with something more complex like Super Mario Bros. or The Legend Of Zelda. It's a great game, but it's short and easy and when you beat it you start back at the beginning and the game gets a tiny bit more difficult each time. That's why this game was better to play in Animal Crossing, because you'll spend more time in that game doing Animal Crossing stuff instead of playing NES games, which is why simple arcade games like this, DK Jr, DK Jr. Math, and Mario Bros. were more common in Animal Crossing than Wario's Woods or Zelda. This game is great, but it's bundled like that in lots of games today, so 500 Wii points could go to something more savory. Great game, a classic i would say. Too bad it's worth 500 points, i believe Nintendo should sell some NES games at a cheaper price, thus there would be more people downloading short-but-fun games like this. good call NES! if this game was only 200 or 250 points I would buy it in a second. Did anybody see king of kong? love the comment on 22. Too much, too little, and really...I got burned on this on the NES. Fool me once. This is a Nintendo game - hell THE Nintendo game! Why, when there is Super Mario Bros., are we missing a level? Loved and dropped many quarters on this in the arcade. I even had the Coleco version (as it came with my console). It had the missing level, albeit with some changes. But it was there! Oh well. If it was a dollar, I'd buy it for the convenience. But I have it in Animal Crossing, and on the NES. No sale. I don't see why everybody hates this game. It is one of my favorite games. 5 stars! Judged on what it is, you cannae really knock this. Legendary! Excellent game for the arcades, but it won't fulful your platforming needs, especially when it had been rereleased about ten times in the last few years. 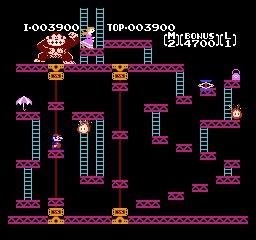 If you want quality DK arcade action, get you hands on the Game Boy version - Donkey Kong 94, as has the four original levels plus 96 more similar puzzle-solving levels in nine different worlds. Also try the Mario vs. DK series for games of similar style. 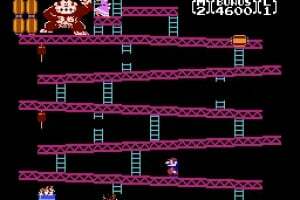 I think Nintendo should give Donkey Kong Classics away free to those people who have already downloaded both Donkey Kong and Donkey Kong Jr.
To put it simply, Donkey Kong is the greatest gameing ape on the market. Don't front, this is one of the best games ever, especially for VC. You can just flip your wii-mote on it's side and use it as the classic NES controller, there is always time for donkey kong. my personal best is "0896900", I love this game. 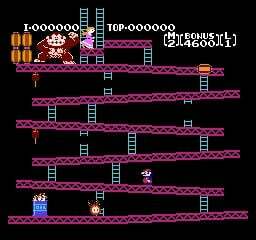 You cannot knock Donkey Kong until you have passed level 5, then you'll be rating it 5 all day long. For those of you who didn't know, in the trial version in Brawl you play at the second level not the first. The reason it's like that because it shows where the 75m stage came from. I already have DK64 so I wont by this game. I remeber one of these cabinents being in a Ice Cream Parlor, never, and I mean never passed the first level. After watching "King of Kong" I been playing this game nonstop, even bought the Wii Fighting stick for this. makes a world of differance. This is THE arcade game, all about timing and skill. I was thinking about getting this, but 3 levels is a bit low . . .
Nintendo should release the original DK arcade game on Wiiware with online leaderboards. That would be awesome! =D and maybe add some extra modes and slightly updated graphics while they're at it. Hey Nintendo, you listening? Or they could just give us DK 64. Whichever. It's hard for me to give it any less than 3 stars because it's generally like the arcade game (which I love). However, if it were exactly like the arcade game, I'd give it 5 stars. 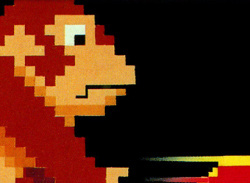 DK for NES just lacks some of the fun of the arcade version. I occasionally throw it on when I need a DK fix and it's adequate for that purpose. I have the DK Classics NES Cartridge, so I have no need to D/L this. It is what it is. Still a decent arcade game, but I would not buy this for the VC. This really is a classic, there's no question of that. The problem is, It can be beaten in less than five minutes, which makes it HARD to justify spending $5 on it. And after that I'm not sure I'd want to play it over and over again. This made Mario and Donkey Kong for what it is. For action puzzle types it' s an excellent game but there are better. For the more casual gamer, this can be quite fun sometimes, but don' t play it too long, because it will get boring. As you read the above, it is also short what makes this game a bit confusing to buy. This is my all-time favorite arcade game. I would have knocked it down to a 4 just because they cut out the "Pie Factory" level that I loved so much, but it's still one of the greatest video games ever made and always will be. I really can't see whats so great about this game. The NES conversion is terrible, it sounds terrible and the fact that the 2nd level in this game isn't included really puts the final nail in the coffin for me. If you really want to play this game play the arcade version on DK64. The sounds are way better and it even has the factory level. not even close. 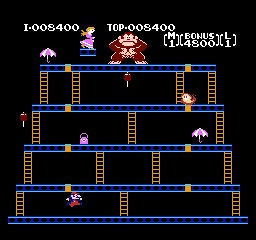 sure there are many far better games at 500 points but Donkey Kong is still more fun than some 500 point games I could mention. 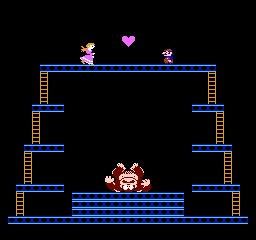 Donkey Kong Jr. Maths for one. Just because it's been released on other systems already doesn't make it bad. It does when those other versions include a whole extra level. I actually love this game 2 stars god people that's a little harsh.This is the game that started Mario a true classic. SSB Brawl convinced me to download it. It is very addictive. Wish I'd bought the GBA version. WOW...I really love playing this game. Its a game that I can play for a few minutes or even longer then stop. The only version I have ever played was the NES one so I am unaware of the "lost gameplay" that other people mention. ummm I thoroughly enjoyed this and ALL the other DK VC releases. Good, but only 3 levels at $5? I actually enjoyed the Atari 7800 version more than this. Don't really know why though, the 7800 version still only had the 3 levels. But I think the levels had a bit more detail, and the graphics were a bit crisper. love this game, its an all-time classic and the first appearence of mario. I love old games and this is no diffeent. Nintendo should have made it with all four levels. But they had a knack for ruining classics. Case and point: Pac man. I bought this for 500 points as well. How dissapointed I was to see what they did to that game. Luckily I was given a ps2 game with 14 classics two of which were Pac man and ms. pac man.The one thing I don't like about DK is if you stop on the top of level one; you can jump barrels over and over, running up the score, before climbing the last ladder. This took the beating my score asspect away. But I'll still run through all three levels once in a while. Am really into dk3 and dkjr right now. Great games.